As readers of this blog and my personal site, The Redhunter, know, every Friday night members of FreeRepublic.com and other patriots assemble outside of Walter Reed Army Medical Center in northwest Washington DC to wave patriotic signs and keep the leftists of Code Pink away from the hospital entrance. Walter Reed is one of the main hospitals in the United States where our wounded warriors from Iraq and Afghanistan go for rehabilitation. Most stay for months, and over the course of time I've come to meet and know many of them and their families. Dozens of times I and others have gone inside the hospital to meet with our troops and bring them what we can, from books and food treats to coloring books for their kids, you name it. Last Friday marked the 64th straight week that we have held our rally at Walter Reed. I have attended since last August, so am almost at my one-year mark. Due to time and distance from my house I attend every other Friday. A complete history of our rallies and face-offs with Code Pink can be found on The Redhunter here. 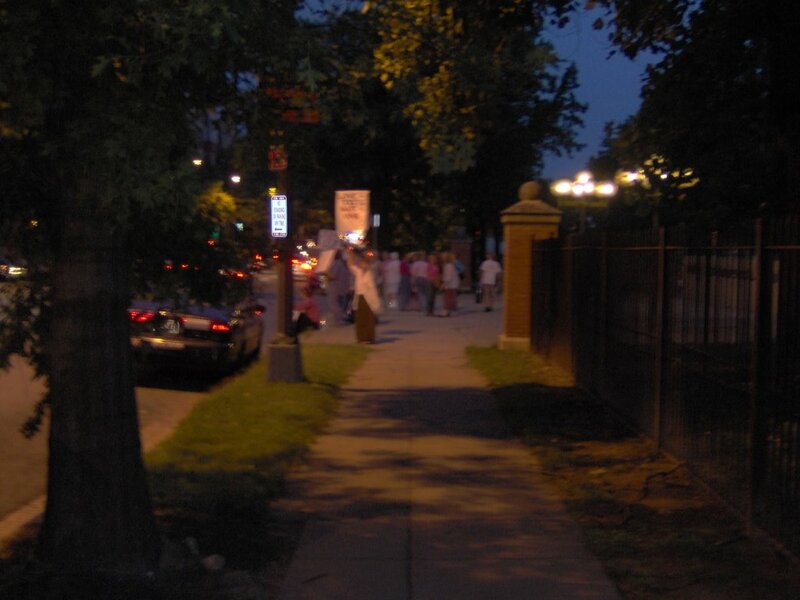 Now that the Pinkos have lost their permit for the corners directly at the entrance they hold their "vigils" halfway down the street, where they are largely out of sight and out of mind. We don't pay much attention to them anymore, nor do the passing motorists. 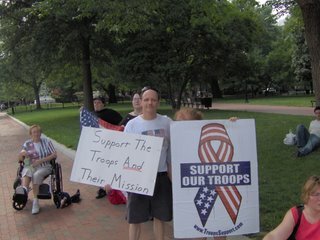 We spend out time waving pro-troops signs, banners, and flags. Lots of people honk their horns for us and/or wave. 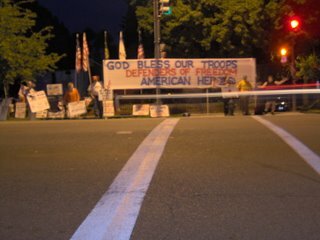 Our presence at the hospital entrance is to keep them away from the entrance and to provide a general show of true support for our troops. 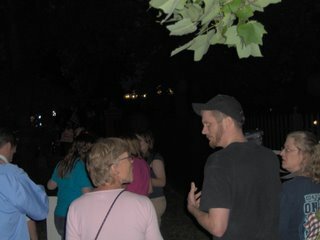 Due to the holiday, I suppose, we had more people that usual show up on our side last night, maybe 30+ people. I estimate the pinkos had about 20+. Here's a photo of our largest banner. This corner is directly across the street from the entrance to the hospital. 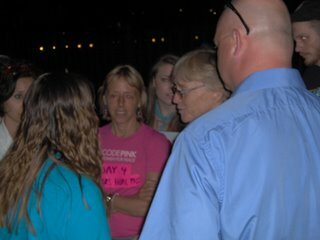 So last night Code Pink founders Medea Benjamin and Gael Murphy decided to pay a visit to one of our corners. I'm still not sure why they did it, although I heard vague reference to them wanting to have a "discussion" or some such matter. At any rate, they were quickly surrounded by Freepers and the others on our side and a "vigorous" discussion ensued (in the ensuing melee I forgot to turn on the red-eye feature of my camera). I didn't hear much of what was said, as there were maybe 20 or 30 people engaged here, with much loud talking and carrying on. I did hear Gael say that they were just trying to "raise awareness" of the war. I shouted at her something like "oh please, everyone knows there's a war on, and how many American's have lost their lives" but so many people were confronting here that she didn't hear or respond to me. A handful of Pinkos came up to join in the fray, but they were vastly outnumbered. One came up to me, and although I forget how the conversation started, I pretty quickly called her a communist sympathizer (or something pretty similar). "Why?" she asked. "Because you hang out with people who like Fidel Castro, and who supported the Sandinistas in the 1980s." "Why do you say communism is bad?" she asked. I mentioned Robert Conquest's books, and the Black Book of Communism, but she wasn't impressed. After a few minutes she went on her way and I resumed taking photographs. This Pinko tried to shake hands with Kristinn Taylor, the president of the DC chapter of FreeRepublic.com, but Kristinn declined. Let's be clear; these are not liberal Democrats, Code Pink is a bunch of communist sympathizers who side with the insurgents in Iraq (at least their leaders do), and hate this country. After about 10 or 15 minutes Medea and Gael decided enough was enough and beat a retreat, rejoining their comrades down the street. We chanted "swim ... to ... Cuba!" after them. Code Pink had planned on spending this past New Year's eve in Cuba, but cancelled the trip when the State Department sent them letters informing them that it was against the law to visit Cuba and threatening fines and penalties. As usual, the pinkos are gone by the time the troop bus arrives. Despite their claim that they are simply "supporting the troops" and "raising awareness of the war's costs", they show no sign of actually wanting to meet or interact with real soldiers and Marines. 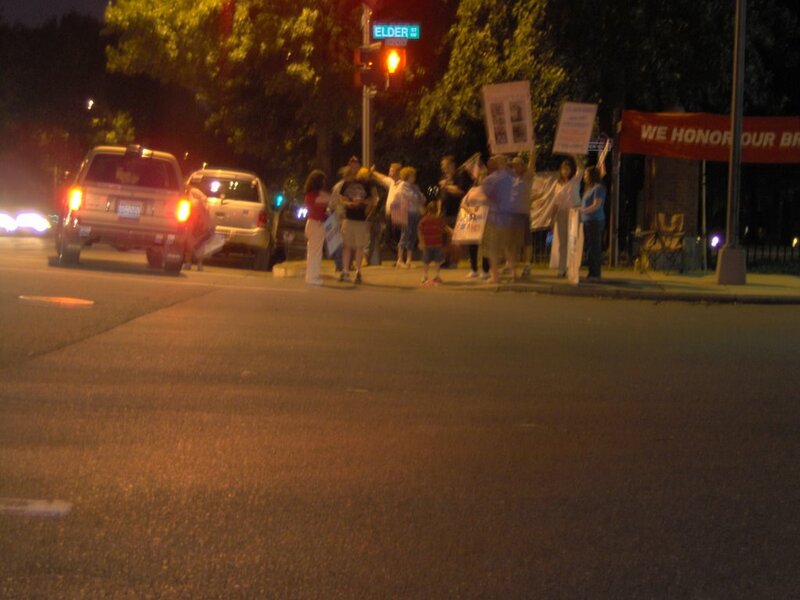 Some time ago, when Code Pink still had the corners directly at the hospital entrance, there was an incident in which troops on the bus gave the one-finger salute to the pinkos on the corner. 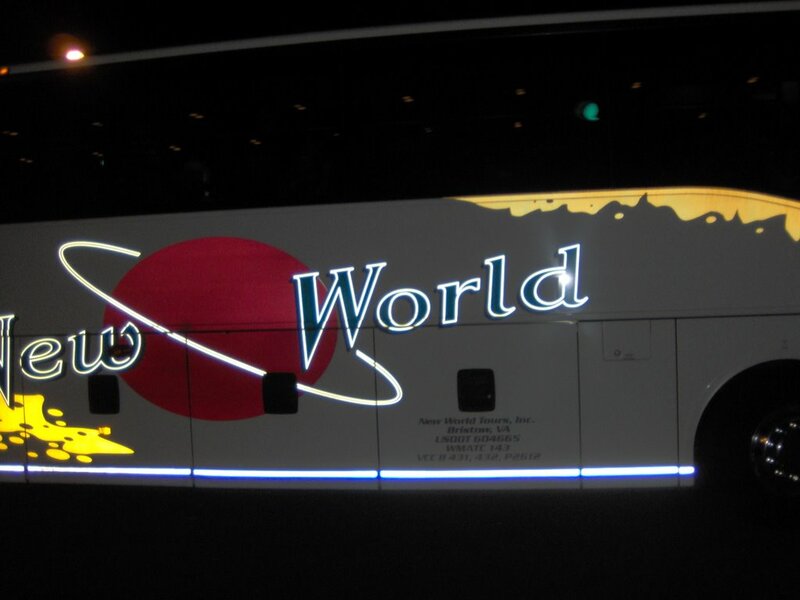 From that evening on, the leaders made sure that they had disbanded their people before the bus arrived. Who are Medea Benjamin and Gael Murphy? As I mentioned, Medea and Gael are two of the founders of Code Pink, Women for Peace. Although Gael shows up occasionally at their Walter Reed "vigils", this is the first time any of us had seen Medea here. Perhaps it was Medea who wanted to come up and see for herself who we were. Medea Benjamin's bio on the Code Pink website. Gael Murphy's bio on the Code Pink website. Medea Benjamin's bio on David Horowitz' DiscoverTheNetworks.org database site of leftist groups and people. According to the description of the group on DiscoverTheNetworks.org the term "code pink" was choosen to mock the Bush Administration's color-coded alert system. 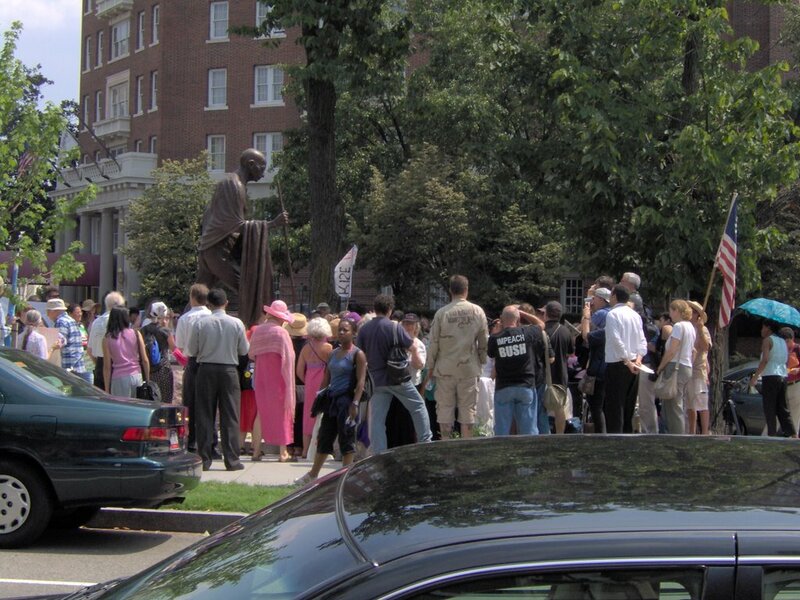 On June 24, 25, and 26 of 2005, a group called Democracy Now! 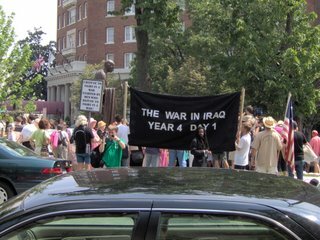 sponsored a "World Tribunal on Iraq" whereby the United States and President Bush were placed on trial for crimes against humanity. They were - surprise - found guilty. Code Pink is listed as one of the endorsers of the event. Ok, that's weird enough, but if that's all there was to it we could write it off as another convention of moonbats. In other words, it is ok to kill American troops. There's no other way to read that paragraph. 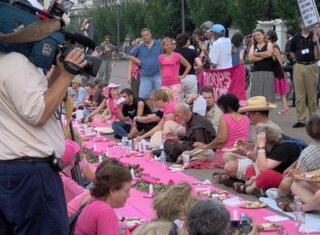 Gael Murphy represented Code Pink at, and was asignatory to, the "Beirut Communique", which was arrived at during a strategy meeting anti-war and anti-globalization types in Beirut, Lebanon September 17-19 of 2004. * We call for the unconditional withdrawal and "coalition" forces from Iraq. In another section, the express their "support for efforts by Iraqis to build a united national front against the occupation." Although they claim that they "oppose war in all forms", there is not a single word in the communique condemning, or even mentioning, Palestinian, Iraqi, or al-Qaeda terrorism. If all this is not a statement of support for the insurgent terrorists plaguing Iraq, then nothing is. And in case your not familiar, the "right of return" is a Palestinian plan to flood Israel with their people, so as to vote the nation out of existence in it's own elections. During the last week of December 2004, Medea Benjamin announced in Amman, Jordan that Code Pink, Global Exchange, and Families for Peace would be donating a combined $600,000 in medical supplies and cash to the terrorist insurgents who were fighting American troops in Fallujah, Iraq. We traveled to Amman, Jordan, with medical supplies, blankets, heaters and water purifiers for the refugees in the camps outside Falluja. Global Exchange received donations of medications from a large pharmaceutical company as well as small donations of supplies and cash valued at $600,000. Who is right? David Horowitz' site says that they gave the aid and money to the insurgent terrorists, Code Pink says that they gave it to refugees. In the Turkish Press article cited above, Medea says that she gave aid to "...families of the 'other side'". At the very least, by "other side", she at least means families of those fighting our troops. If someone had given aid and comfort to German or Japanese families during World War II, they would have been guilty of treason. Examining the matter in some detail in an article on FrontpageMag(also a David Horowitz site), Ben Johnson concludes that "Medea Benjamin has the motive, and her allies have actively comforted our enemies before. And some in her recent Iraqi caravan have personal ties to terrorism." My guess is that they gave the aid to people who in turn gave some or most of it to the terrorists, or maybe they gave it to people who were terrorists themselves but represented themselves as "refugee workers". Either way, Medea knew the terrorists would get some, part, or most of the aid, and intended this to happen, but also wanted "plausible deniability". 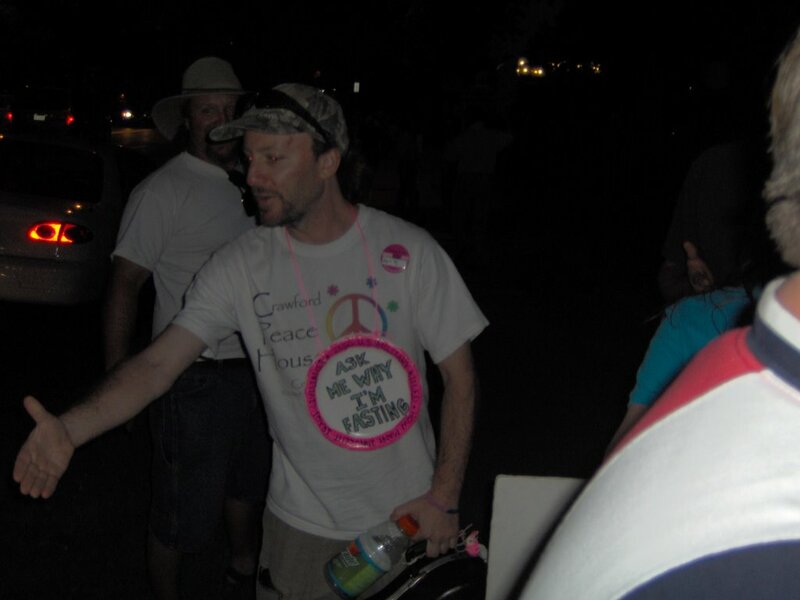 Either way, Code Pink is a disgraceful outfit, and I figure it's the least I can do to help keep them away from the hospital entrance. If you're even in Washington DC over a weekend, stop by and give us a hand. I can't promise any confrontations with the leftists, but can promise lots of friendly waves and honks from motorists, and a lot of thankful troops. Yesterday, I saw United 93, the documentary movie about the plane that didn't reach its designated target on 9/11 because the brave passengers resisted the hijackers and tried to regain control of the plane. The movie is definitely worth a visit to the cinema (in case you have not gone to see it yet), many actors in fact play themselves as civilian (FAA) or military (NORAD) air traffic controllers. This gives the movie a very authentic touch. And it is hard not to feel that incredible rage again when you see those images of the impact of United 175 into the south tower of the WTC. However, one thing in the movie bothered me a lot, although it does not play a prominent role in the movie: the pilot among the hijackers of United 93, Ziad Jarrah, is portrayed as a doubting, hesitant figure. You can tell this by his body language, he leaves a last message on his wife's phone, he hesitates to give the sign for the take-over. I do not understand why the director did this. Was it because Jarrah was later characterized as a macho bon-vivant and therefore an unlikely contestant for jihad (like the terrorists of 7/7), was it because he failed in his mission? I just don't see any justification for such explanations. It is totally unimaginable that Osama Bin Laden would give part of the most sophisticated operation ever done by Al Qaeda in the hands of a man with doubts about what he was about to do. Jarrah was not "just a man, who, like everyone else, has his doubts". I don't buy that. Jarrah was a fanatic mass-murderer, period, who chose to express his grievances in the most violent way. Such a characterization is so exemplary of people who prefer not to face unpleasant facts and their implications, because they don't fit into their way of thinking. All the credit goes to the passengers who where the first line of defense on that beautiful September morning again those acts of pure evil. What a pity that not everybody can bring themselves to see them that way. 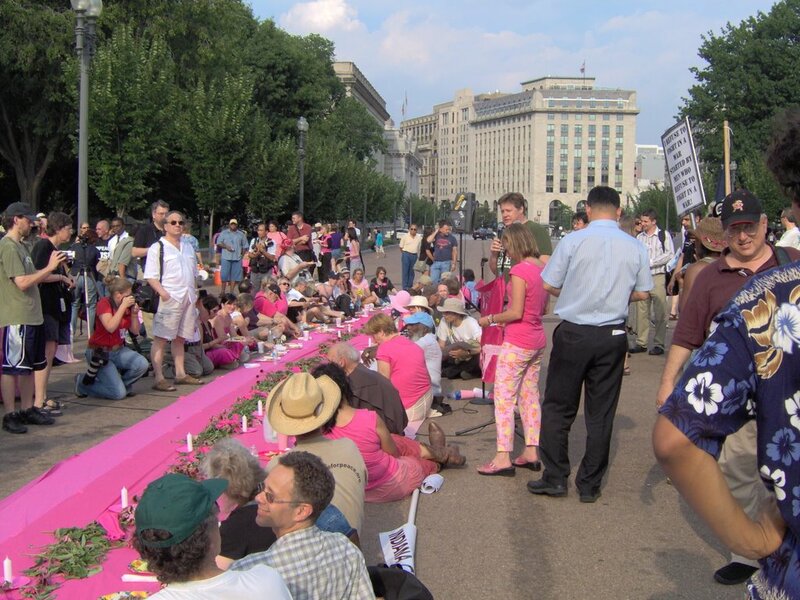 In a blatant attempt to gain media attention, Cindy Sheehan ate her "last supper" today in front of the White House before she goes on a hunger strike to call attention to the war (or her, which is more the truth). Yours truely, along with about a dozen other intrepid FreeRepublic patriots, was there to counter-demonstrate and record the whole thing. At about 3pm today the leftists arrived at the Mahatma Gandhi Memorial outside of the Embassy of India on Massachusetts Avenue in northwest Washington DC. Unlucky for them, we were positioned across the street to greet them. Here we are on the other side of the street. We had maybe a dozen people on our side. I estimated the lefties across the street to be about 100, maybe more. In case the photo isn't clear it the banner says "Cindy Sheehan: Starving for Attention"
The point of the affair is that Cindy Sheehan, idol of the radical anti-war left and media whore, has decided to go on a hunger strike along with several other fellow moonbats. ...committed to fast during this hunger strike because it's time to raise the visibility and the ante. While I spend every day with pink fingernails and a button to publicize my opposition to this war and my call for peace, it's essential that we get more serious and raise the ante and the visibility, and get more people participating in our opposition to the war. There were plenty of police around, but by their relaxed attitude they obviously did not expect any trouble. Their job was to keep the lefties on their side of the street and us on ours. A couple of times a leftie or two tried to come over and try to debate us, and there were a few shouting matches, but nothing serious. These guys are having trouble with their dates, or are too lazy to change their sign. 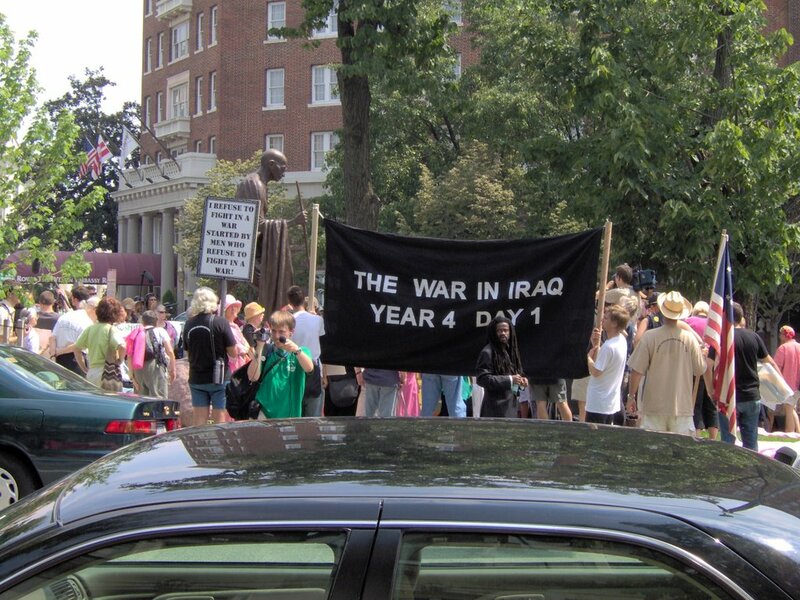 Operation Iraqi Freedom started on April 2003, so it's more than 4 years and 1 day. We hollered that they were desacrating the flab, but of course they didn't care. That's one thing I've noticed about leftist demonstrators; they either don't have American flags at all, or they're all jazzed up with something. Rarely do they just have straight American flags. Many times during the rallys and protests that I've taken part in, I have been interviewed by reporters. I've come to notice that there are two types; the mainstream media, and independents. By "mainstream media" I mean repoters from newspapers, radio stations, or the like, and I've been interviewed by reporters from the Washington Post, The Associated Press, Dutch Public Television, even "alternative" outlets like the Afro-American (who interviewed me during the big Sept 25 2005 protests). 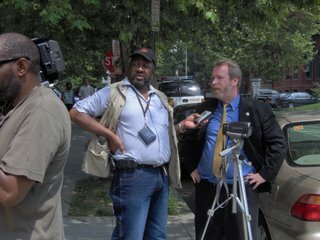 During these street interviews I have received nothing but straight and fair interviews from these reporters. They ask questions like "What is the message you are trying to get out?" and "What brings you to this rally?" They don't try to nitpick or catch you up, either, but just ask the question, accept whatever you say and move on. Then there are the independents. You never know what you are going to get with them. Sometimes they do it straight, and then sometimes they have an obvious agenda and the "interview" turns into more of a debate. This happened today with two guys who came to our side. One did the camera and mic, the other asked the questions (I didn't get a photo of them). He only asked me one or two fairly straight questions, then moved on. Settling on a lady in our group, he started in with "I've interviewed Iraq war veterans who say that they've received orders to shoot women and children. What do you say to that?" and "Female American soldiers are afraid to walk across American bases at night for fear that they will be raped (by American male soldiers. What do you say to that?" He went on like this, obviously looking for a reaction and an argument. We eventually told him to get the hell away from us. 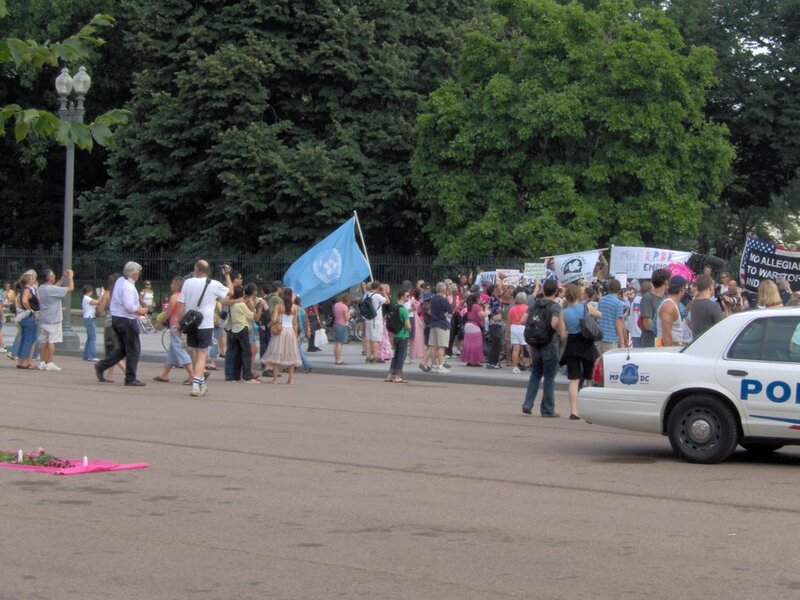 After about 45 minutes or so of this nonsense the lefties gathered their things and marched down Massachusetts Avenue to Lafayette Park, which was about a mile away, maybe less. Lafayette Park is across the street from the north face of the White House. As the street is is only a short distance from the White House itself (maybe just over 100 ft? ), for security reasons the street has been blocked off and is essentially now part of the park. 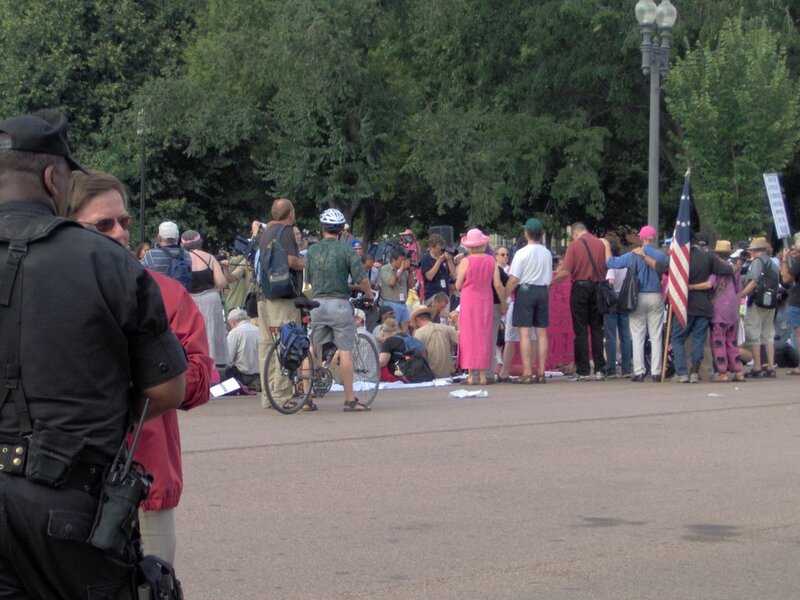 This park is the traditional center of anti-government protests, and there is always one leftist group or another holding some sort of protest or vigil. Check it out the next time you're in Washington DC. We too gathered our things, but instead of following the leftists we got in our cars and drove down. Once we saw where they were set up in the park we again organized our counter-demonstration. 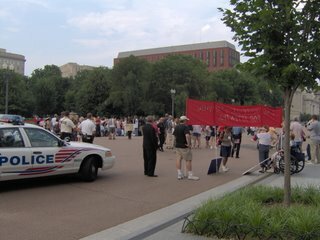 After getting their crowd together, the lefties all went up to the White House fence where they chanted various slogans. Unfortunately I did not think to get a photo with the White House actuall in it. It is just off screen to the right. I almost forgot to have someone take my picture. This time I decided to go with a "pro" message rather than an "anti" one. The Freeper under her sign at my left doesn't want her photo on the Internet (if she can help it), something about her work, I think. The lefties then walked back about a hundred feet and set up camp on the other side of the street. We walked back to about where they had been, and I took this photo with us in the forground and them in the background. The White House is to my right. 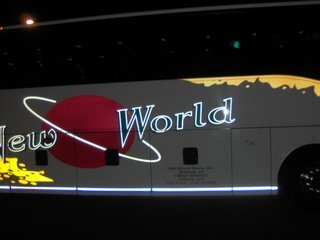 During all this tourists passed by, wondering I suppose if they'd wandered into an alternate universe. Must just snapped photos of the two groups and went on their way, but several times people came up to us, shook all of our hands, and said "thank you for doing this!" 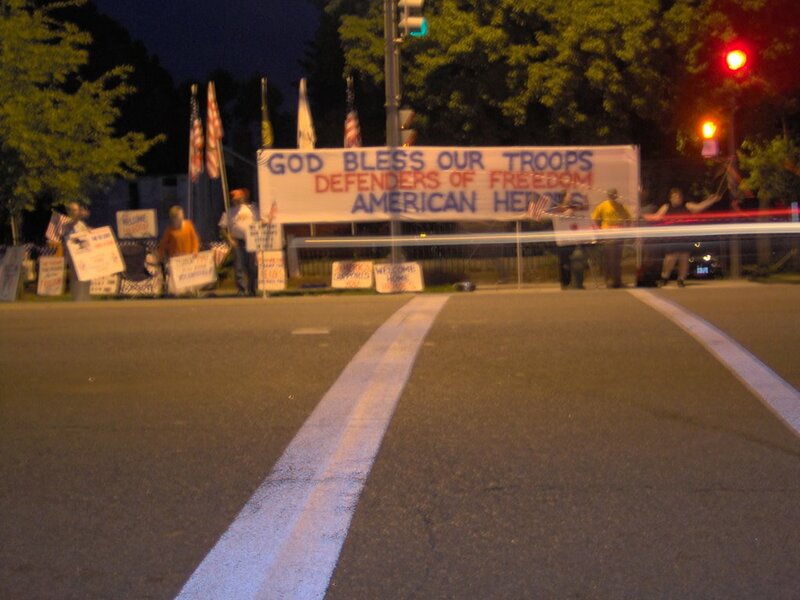 At least three were Iraqi war veterans home on leave. Again, a few times a leftie or two would come over and try to engage us, but the police kept them away. Both at the Gandhi Memorial and at Lafayette Park we spoke with several of the officers, most of them seemed either bored or amused by the entire spectacle. No doubt they've seen hundreds of these sorts of things, and unlike during the '60s, rarely does violence or trouble break out at the smaller ones (the big ones are another story. I've seen the DC police in action, like at the big Sept 25 1005 anti-war protests, and they are out in force and are dead serious in their work. All of this went on for about an hour. They had a portable loudspeaker system and several of them gave fierly yet boringly predictable speaches. I've heard it all before. 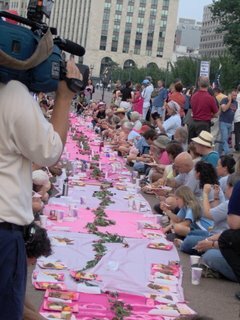 Code Pink had set down a long pink cloth maybe three feet wide and 50 feet long on which they would hold their last supper before the fast (everything is pink at their damn events, it seems). They had a food preparation table nearby, and most of them then sat down to have their last meal. At this point I left my post and went forward to take some photos. Here's Cindy, you can see her sitting down in the middle of the photo. I think that the woman standing right above her in a pink shirt is Medea Benjamin, one of the leaders of Code Pink and a commie if there ever was one. At about 6:30 I decided enough was enough and headed for home. All in all, I find it hard to take these people seriously. 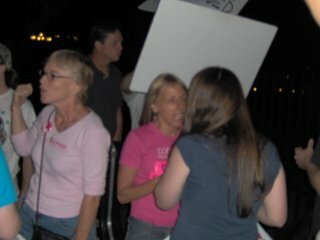 Yes Cindy Sheehan will garner some media attention with her stunt. But her and Code Pink are so whacked out of their minds that rational discourse with them is impossible. Their arguments, such as they are, are not to be taken seriously. What is of concern is how more mainstream leftist groups like Moveon.org and the Daily Kos are affecting the Democrat Party. That is a subject for another post, but suffice it to say for now that I think these things run downhill: Code Pink/Cindy Sheehan affects Moveon.org and the Daily Kos, and they in turn affect the Democrat Party. None of this can be good for our country, because we have a war to win, and the lefties of Code Pink are rooting for our enemies. A Reuters story in The Washington Post is a reasonably fair account, their reporter estimating 150 demonstrators at the event. The story adds that most of the protesters will only fast for 24 hours, while Sheehan will carry on through the summer at President Bush's ranch in Crawford Texas. The story on the Reuters site is can be found here. 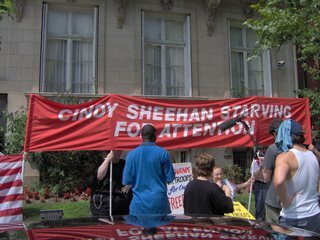 About 20 supporters of the Washington-based group Free Republic gathered under a banner that read "Cindy Sheehan's starving for attention," near the Ghandi statue while some held American flags. "She's been a publicity hound for the past year with her so-called antiwar efforts," said Kristinn Taylor, a spokesman for the group. 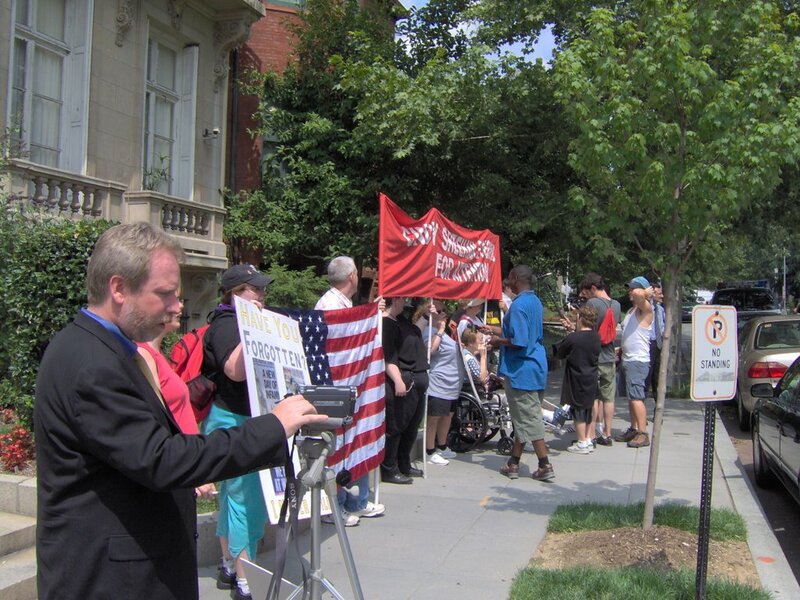 From noon to 1:00, Kristinn and some Freepers held a protest outside the New York Times office in Washington DC. I didn't make it for that one, but Michelle Malkin has the story and photos. Yahoo News has a photo of Sheehan and Susan Sarandon from the event. As of this update there's nothing on CNN or MSNBC that I can find. National Review's The Corner blog seems to be ignoring the story as well. Dittos for the British newspapers The Guardian, Sunday Times of London, and the Telegraph. Nothing on the BBC site either. I saw several AP reporters there, but can't find anything on the Associated Press site about the event. They're not a news outlet, but Little Green Footballs, of course, doesn't miss the event. As always, the comments section is just about the best part of the post. Other than that, I can't find much of anything out there about Sheehan's stunt. Most people and news outlets are sensibly concentrating on Independence Day. We'll see what happens in the weeks ahead. But the sooner Sheehan disappears from the news the better.